For the third weekend in November, a group of us were invited by Blake Kuhlman to a quail hunt in Nueva Cuidad Guerrero, Mexico. 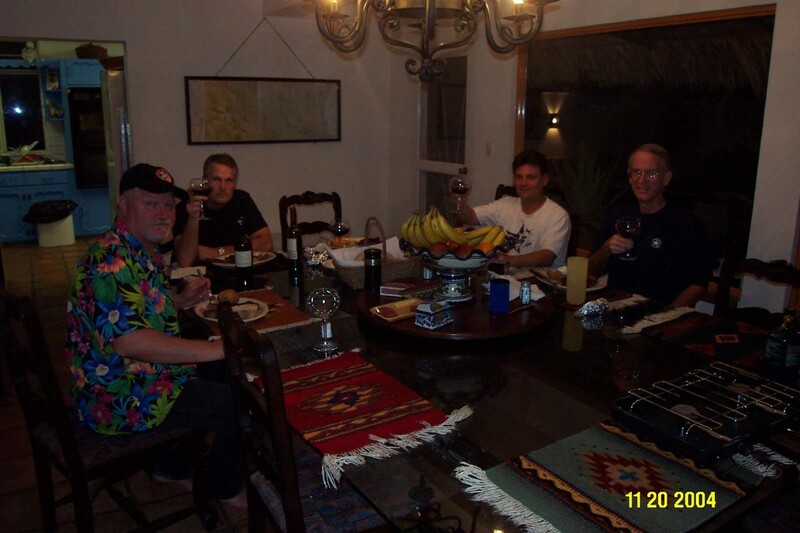 On Thursday November 18, 2004, I flew my Cessna from Chicago to Dallas where I joined Jack Pfeffer for dinner. 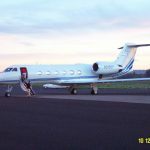 Friday morning, we were joined by John Kober, an attorney from Dallas and I flew the three of us down to a small uncontrolled airport in Zapata, Texas. 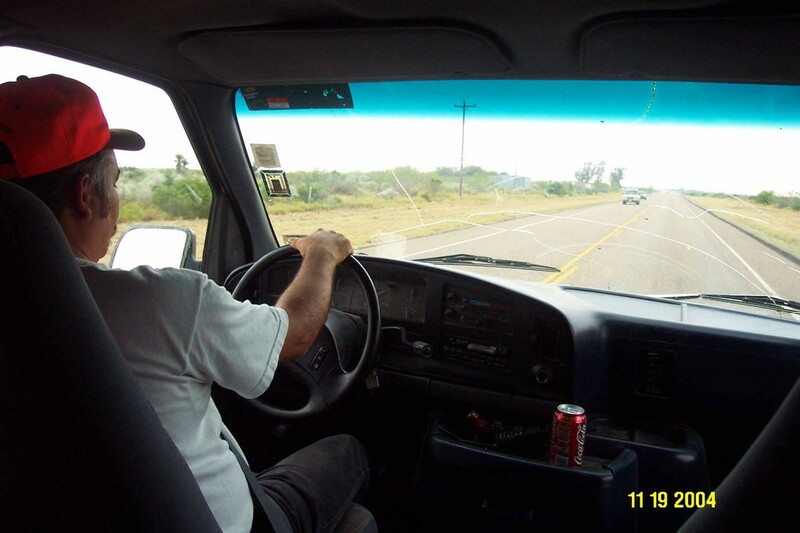 There we were met by a guide, Chui, and driven to the camp Nueva Cuidad Guerrero, Mexico. 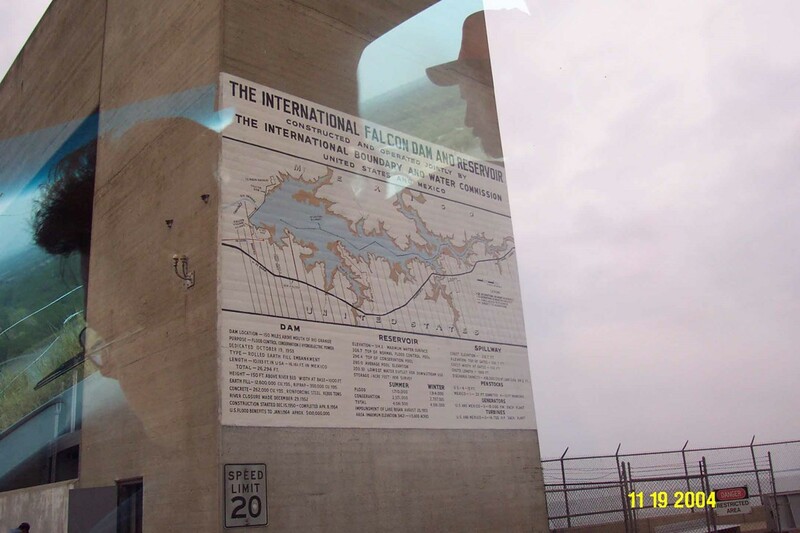 We drove about 20 minutes along the United States side of the border until we came to the Falcon Dam which is a crossing point into Mexico. 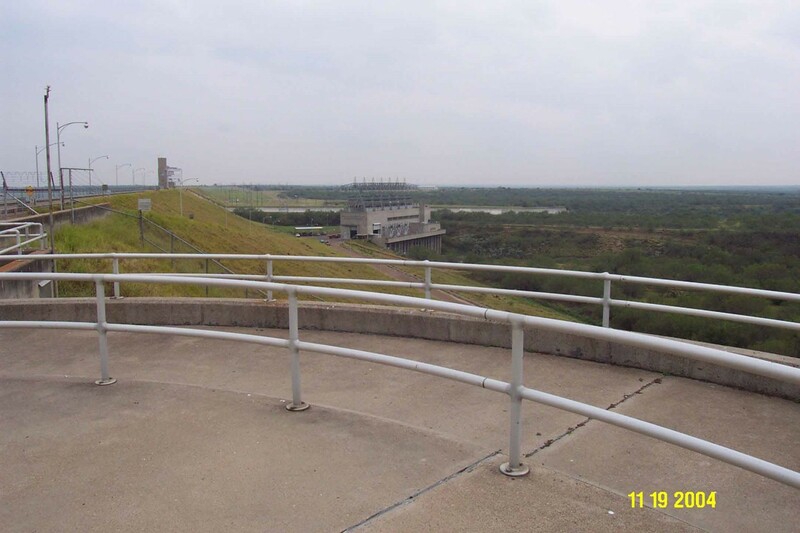 This dam was a joint project of the United States and Mexico and there are border guards and check points on each side of the road across the dam. 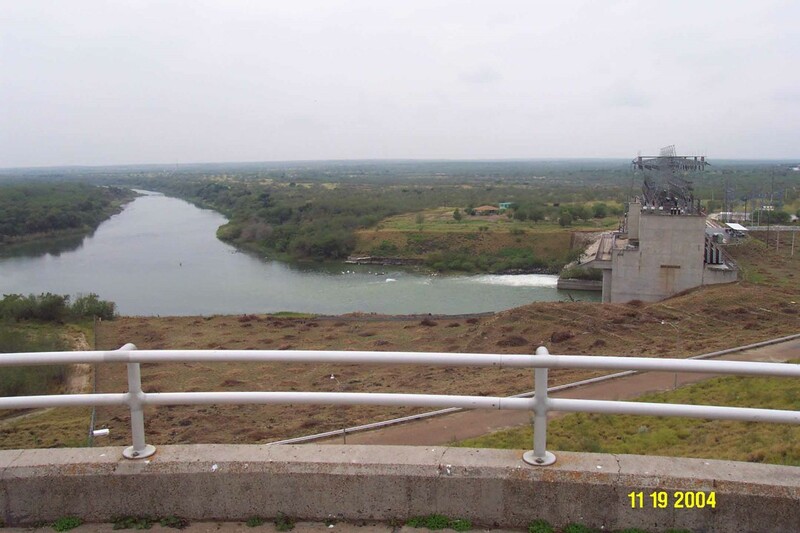 We later learned that when they built the dam and flooded the area behind it, they flooded the original town of Guerrero. The mission in this town was older than the Alamo. 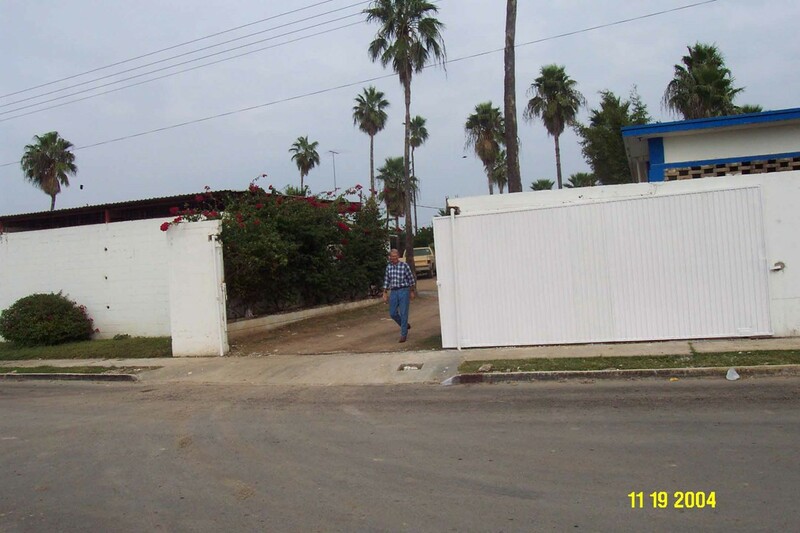 The government of Mexico relocated all of the citizens of Guerrero to Nueva Ciudad Guerrero which is where the camp is now located. Below is a map of the area flooded by the dam. 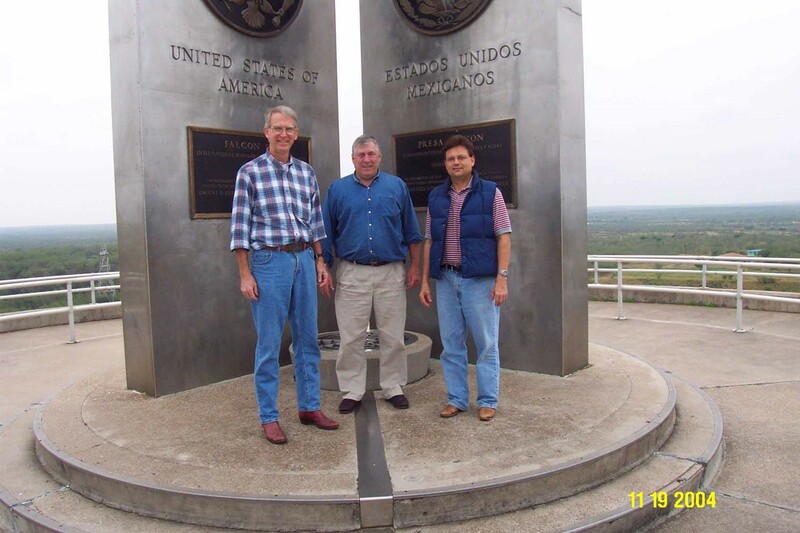 At the Mexican border, the three of us had our picture taken in front of the landmark separating the two countries. 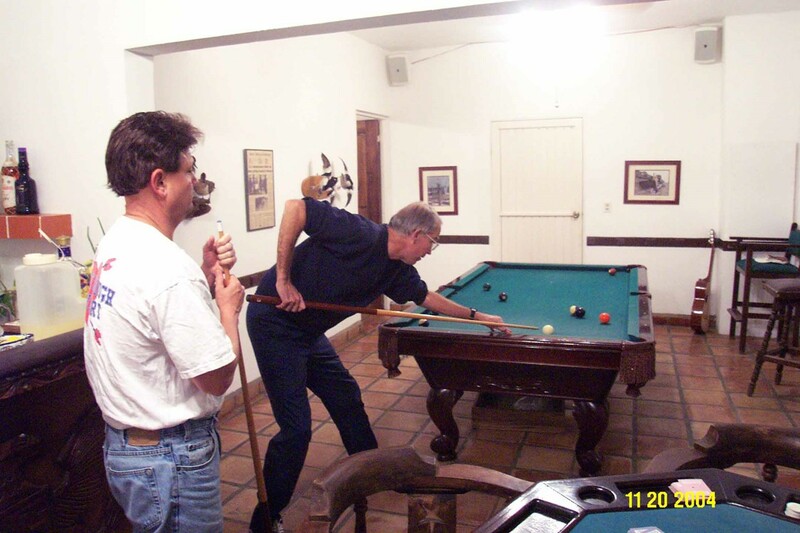 Below is Jack Pfeffer on the left, John Kober on the right and me straddling the border. There are two separate and distinct electric power plants at the Falcon dam. One on the United States side. 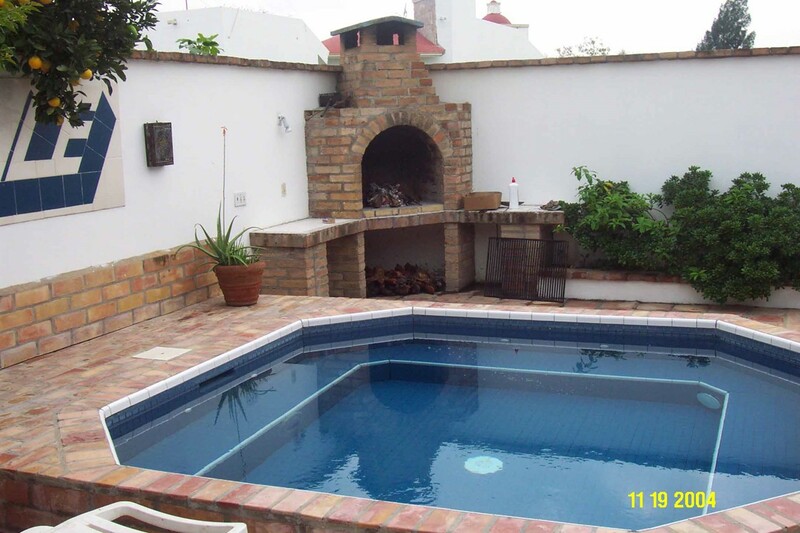 And the other on the Mexican side. The crossing into Mexico was uneventful. The checkpoint was manned but they recognized our driver and waived us through. We arrived at the camp and noticed that it was surrounded by a stone wall. Jack Pfeffer is pictured walking out of the gate. 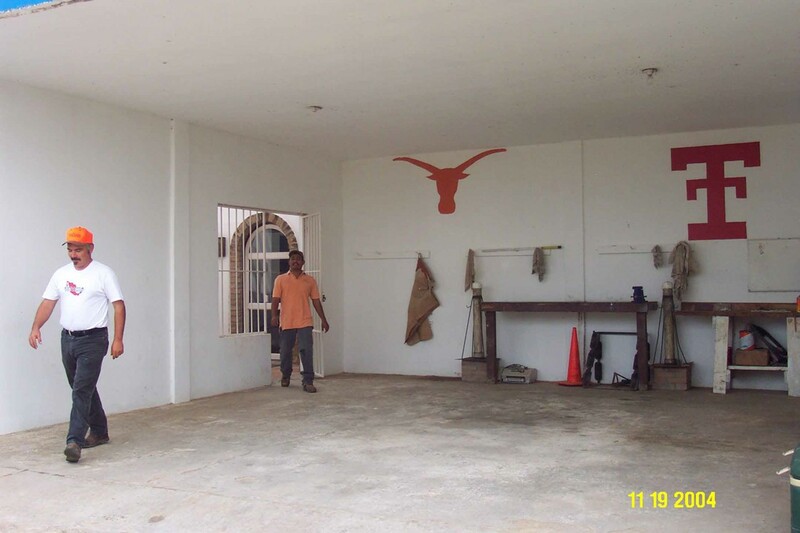 The garage shows the college allegiance of the owners. We relaxed for about an hour and enjoyed a lunch prepared by Maria, the camp’s cook. 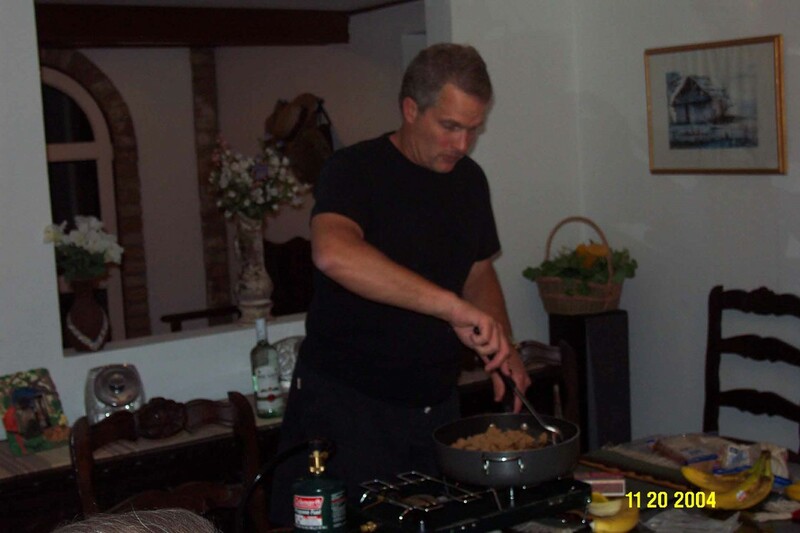 Below is Zane Hudson, definitely not in quail hunting attire, preparing to grab a bite of lunch. 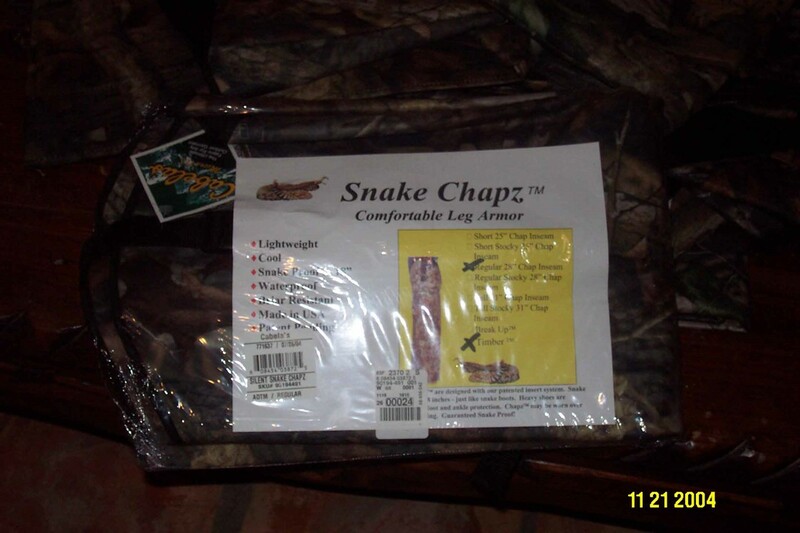 Blake gave us each a pair of chaps to protect our legs from thorns, cactus needles and rattle snakes. 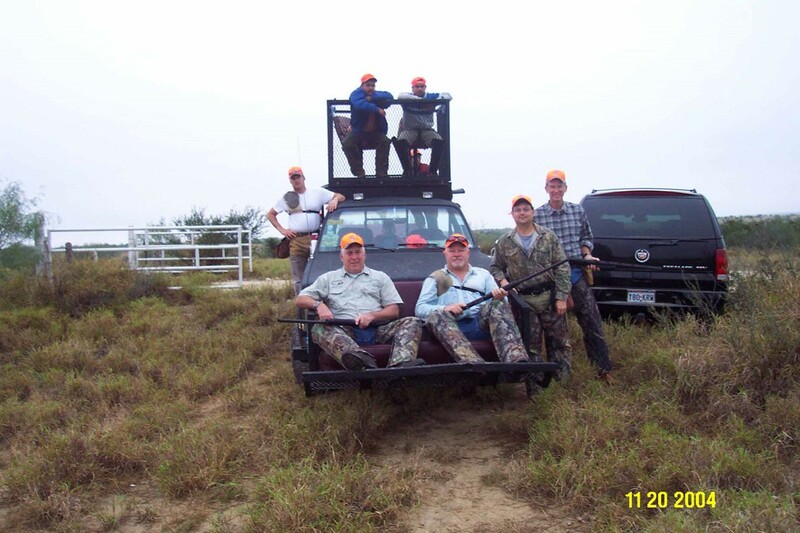 He also gave each of us a bright orange cap to help us avoid shooting each other while hunting. 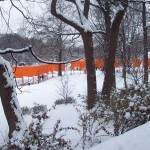 Below is the bedroom to which I was assigned with my orange hat. 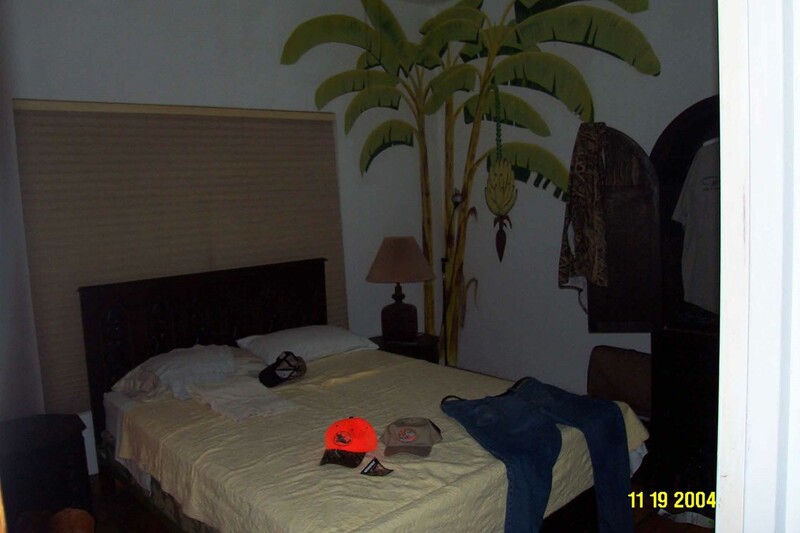 This room was labeled the “banana room” because of the wall painting. 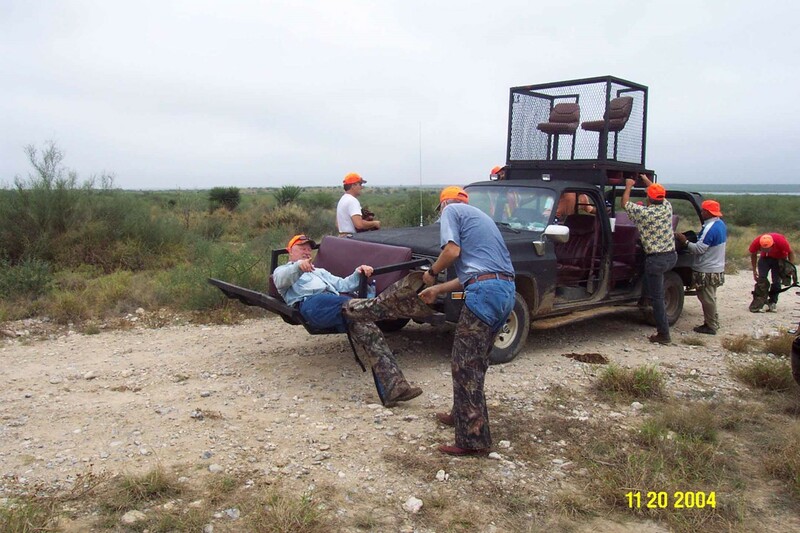 After some coaching on the proper shoes and attire, we loaded up and headed out for our first quail hunt. During the drive, Blake gave us some instruction on flushing the coveys of quail and pursuing them into the fields. The fields where we were to hunt were fenced-off very large cattle grazing fields filled with cactus and thorn bushes of many varieties. The grasses were knee-high and most of the thorny bushes were at shoulder height. After about a 20 minute drive, we arrived at the field for our afternoon hunts. Here we go out of the very comfortable Cadillac Escallade and climbed into what can best be described as a modified dune buggy. We each struggled to put on our chaps. We were each then handed a shotgun and an ammunition bag to wear around our waists, loaded with a dozen shotgun shells. We then boarded the buggy to try our luck. The guide would be the driver and each of us was assigned a “bird boy” to stay with us. 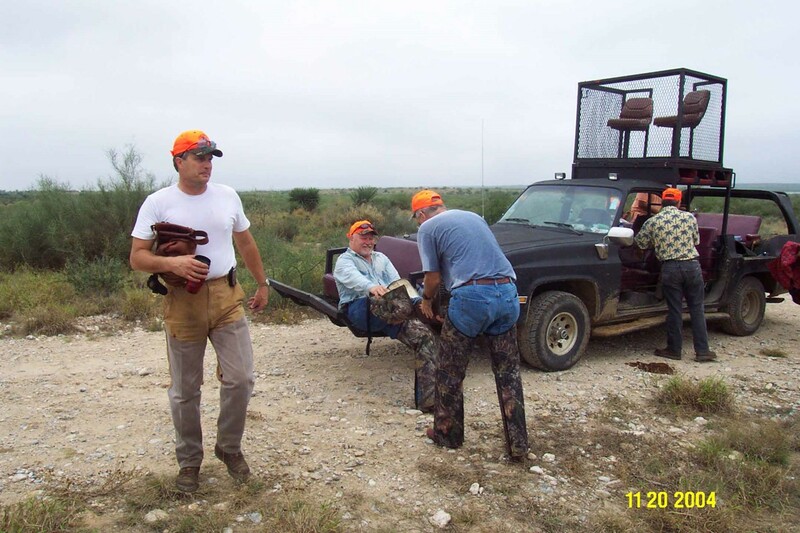 The bird boys would help flush the birds and retrieve them after each successful shooting. 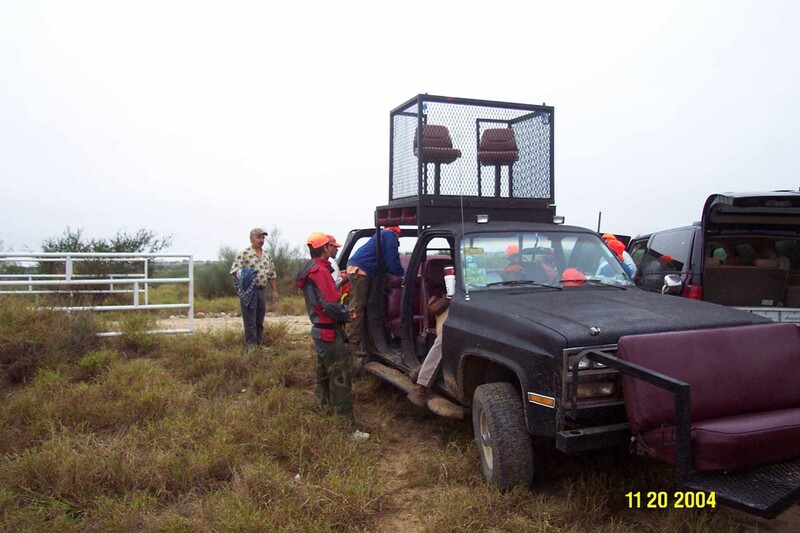 We loaded up the buggy with two hunters out front and three inside the vehicle. 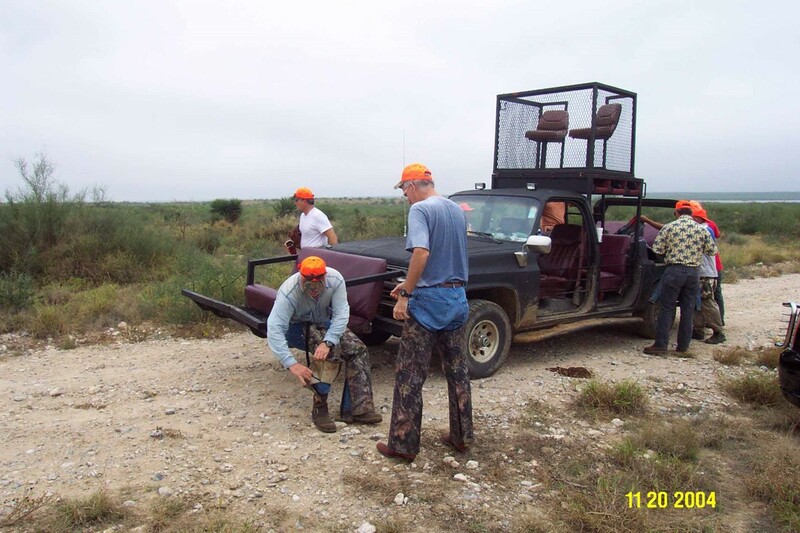 Two bird boys were in chairs on the platform on top of the buggy and their job was to spot quail. The others rode in the back. Here we are ready to flush the coveys. That is our host, Blake, on the left, the author and Zane Hudson on the front, John Kober and Jack Pfeffer on the right. The “roads” through the fields were barely that, but the guide was a good driver. Some roads around the fence line had been plowed recently by a grader. Other times, however, the driver would turn off the plowed road and drive down paths over-grown with grass and thorn bushes. We went wherever the birds might be. We hunted about 3 hours until it was dark enough that it was no longer safe to be shooting weapons. In total, we killed 17 birds on the first day. When we got back to the gate to exit the hunting fields, we had to take off the chaps that had taken so long to put on. This was not an easy process. Then we drove back to the camp. We were all sweaty and exhausted from chasing quail through fields of thorny bushes and cactus. Fortunately, the camp had a wonderful patio with a hot tub. It didn’t take long before we were all in swim suits and soaking in the hot tub. 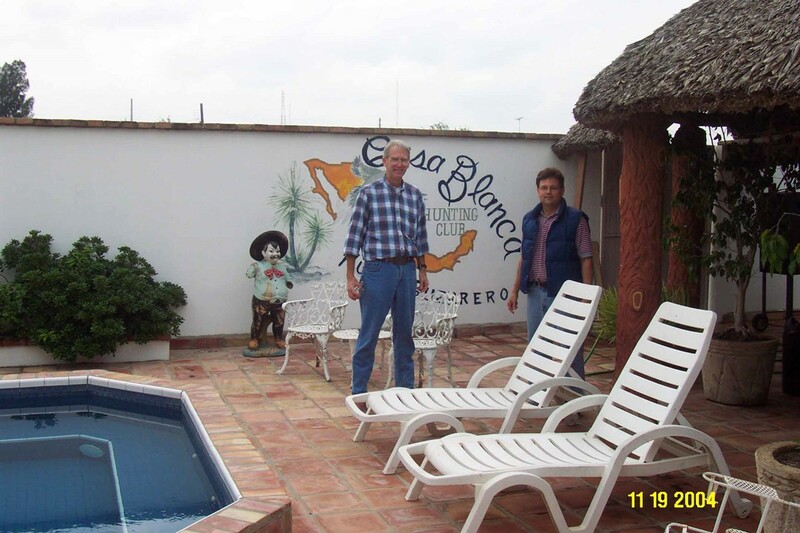 Below, Jack and John are on the patio and checking out the hot tub. 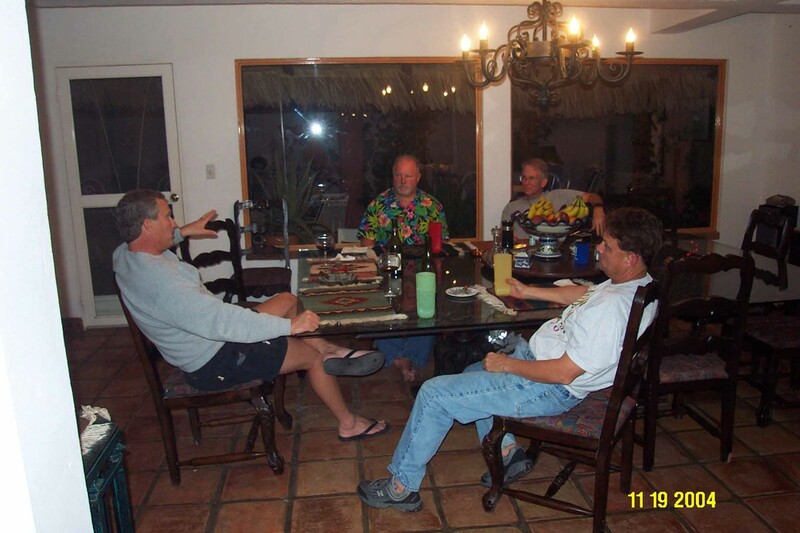 After a long soak, we gathered around the dining room table for cocktails and conversation. 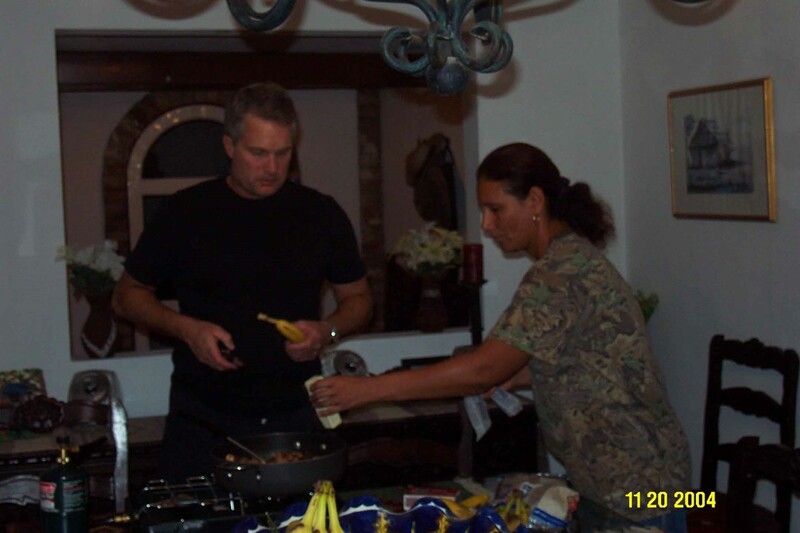 We had a great Mexican feast prepared by Mzria. Following dinner we enjoyed an after dinner drink and some of us, a cigar. We all went to bed early. We were awaken early the next morning when Blake cranked up the stereo and played the Rolling Stones “Start Me Up”. Believe me, no one slept through it. We had good hunt on Saturday morning and killed another 20 birds. But birds weren’t the only thing we shot. 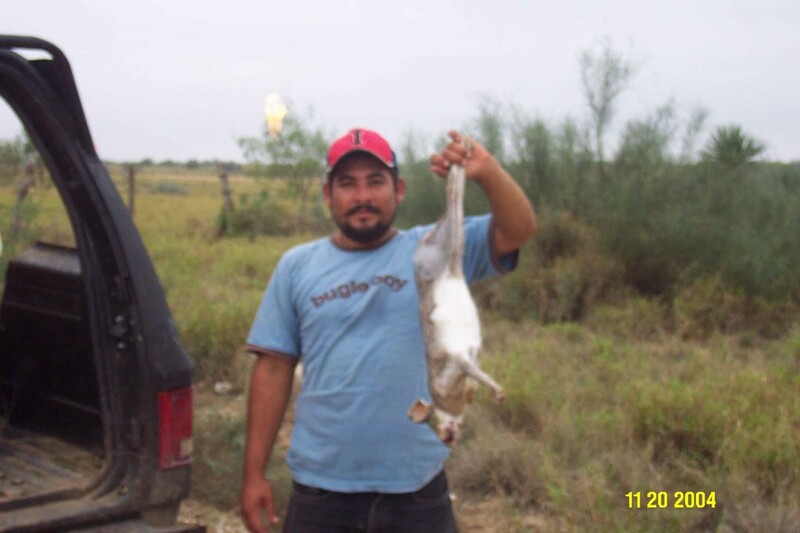 We also shot a very large jack rabbit. One of the bird boys also spotted a rattle snake which was shot and brought home as well. We came back to the camp and cleaned up and changed clothes for a visit into town. 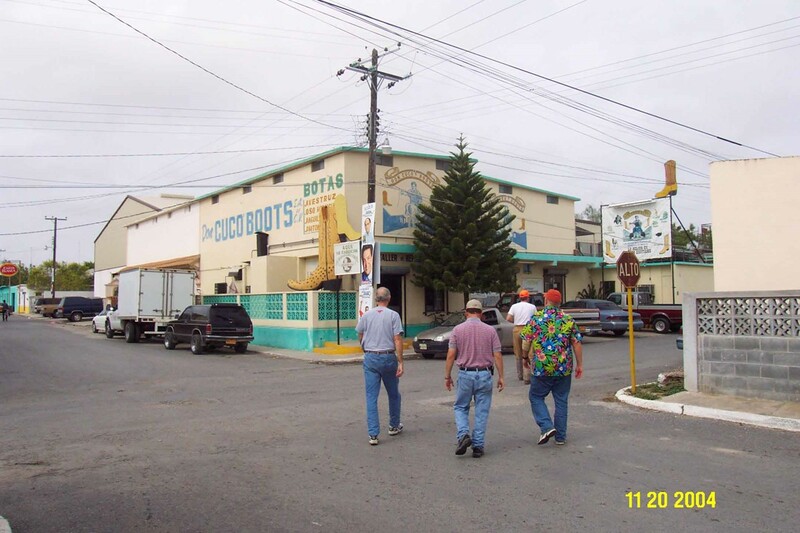 We drove into town to Mexico’s greatest boot shop, Cuco Boots. This is one amazing boot store with a huge selection. 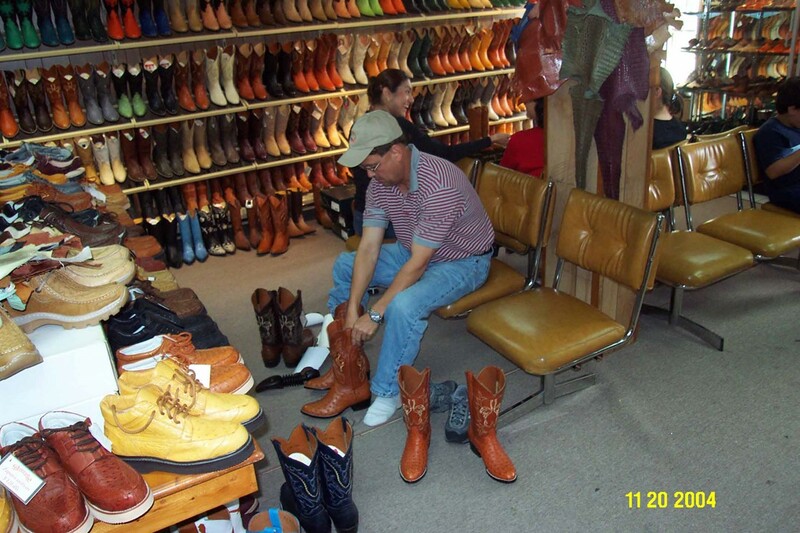 Below John Kober is trying on boots looking for a pair his size. 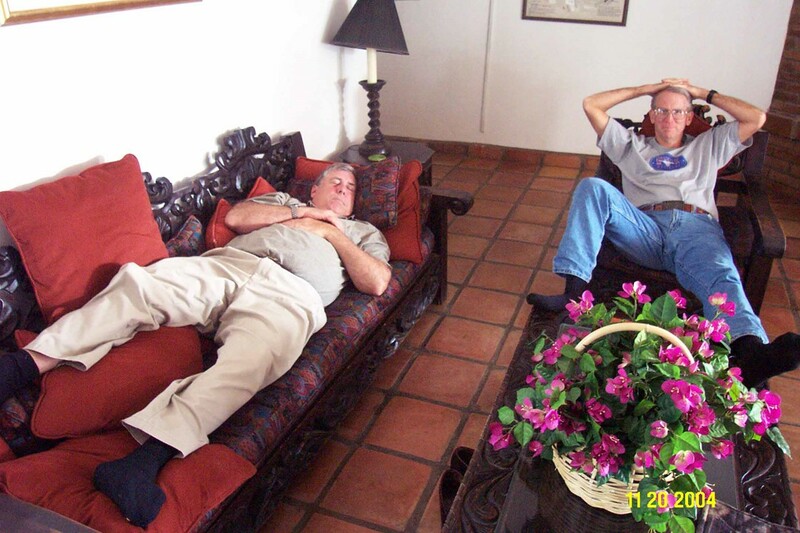 Some found the shopping trip exhausting and retired for a brief nap before venturing out for the late afternoon final hunt. The author is asleep on the couch and Jack Pfeffer is watching football on television. The Saturday afternoon hunt was also successful. In total with the three hunts over the two days, we killed 61 birds. Blake was the better shot and was credited with the most kills. Once again, we pealed off our chaps and shooting gear and returned to camp. After the hot tub we were treated to a fantastic steak dinner. 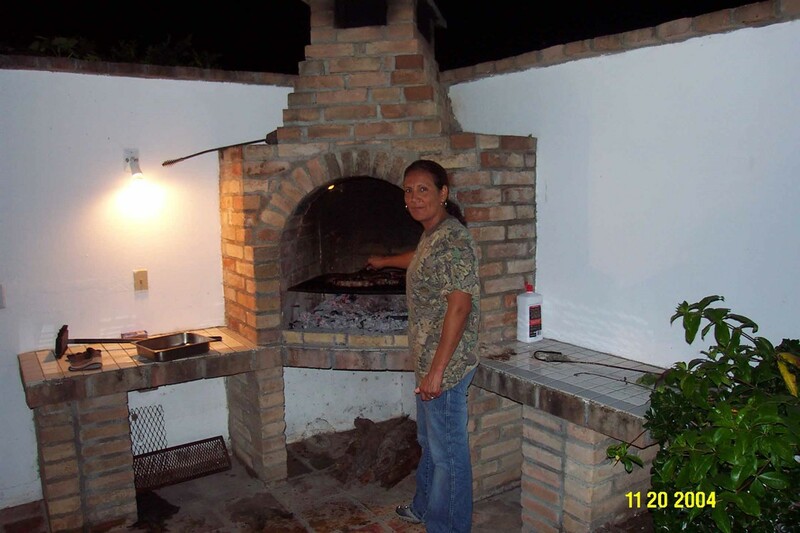 The steaks were mesquite grilled on the outdoor fireplace by Maria. Dinner included a lot of good conversation. 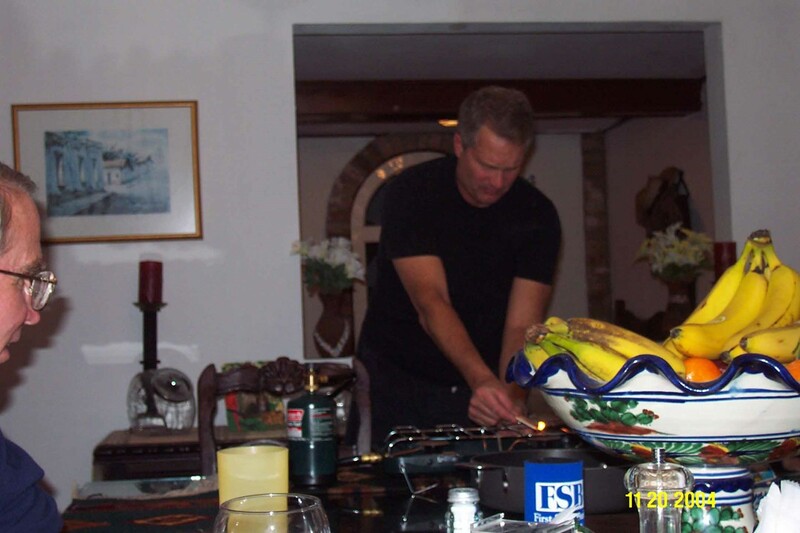 The special treat of the evening was banana’s foster prepared by our host, Blake Kuhlman. By Saturday night, everyone was very tired and by 10:00 we were all in bed. Sunday morning we were up at about 6:30. It took a while for everyone to take showers and get their bags packed. 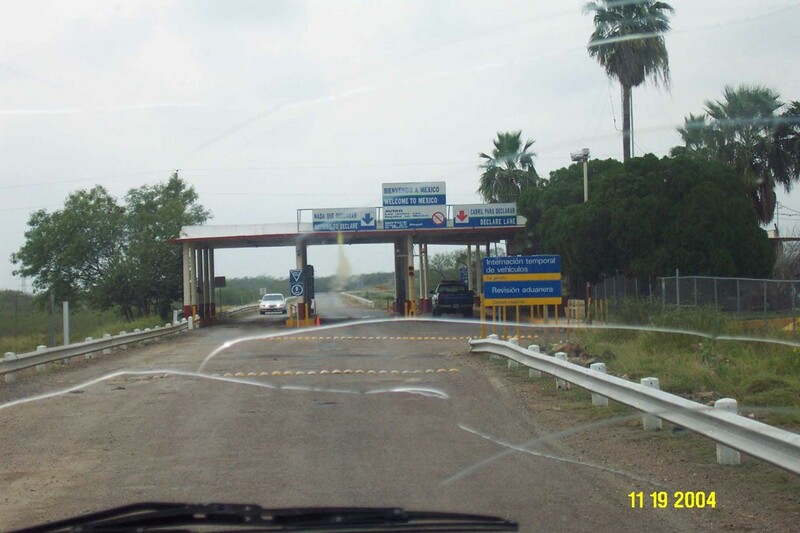 The border crossing at the bridge didn’t open until 7:00. We didn’t want to be the first in line at the border so we took our time getting ready to leave. Blake and Zane dropped us off at the Zapata airport and after one last photo, we said our goodbyes. Blake and Zane left for their drive back to Austin, Texas. 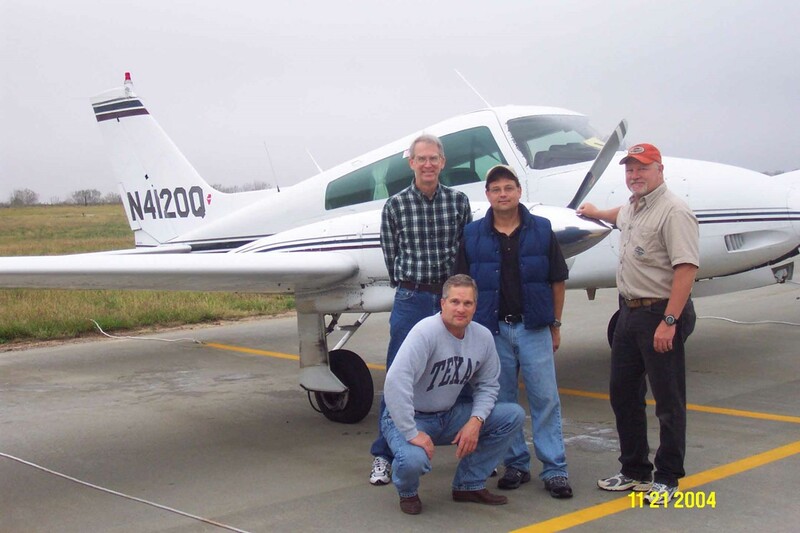 Jack, John and I boarded the Cessna and flew to Dallas Love Field. I dropped them off, refueled and flew myself back to Chicago. Throughout the weekend, Blake had been a perfect host. 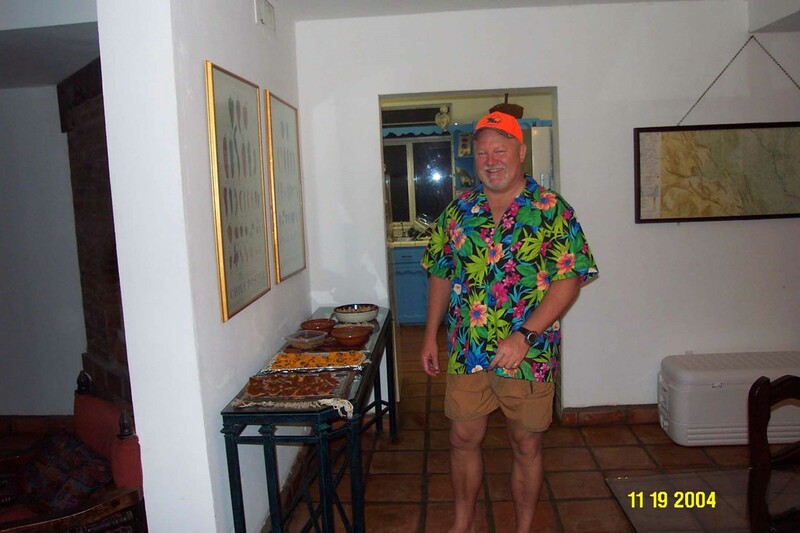 He made us all feel very welcome and took good care of us.